Over the past few weeks we’ve been to the top of the ridge, walked along the valley floor and discovered a marvellous gorge somewhere in between. Today I thought we’d go top to bottom starting on the ridge and gradually making our way down to the lower slopes looking at the origins of the various lifeforms that we encounter along the way. Up here amongst the limestone crags it never fails to amaze me how life will exploit any opportunity to take hold. In every little nook and cranny where there’s a bit of nutrition to be had something will get itself going. This is a bit like the Rock of Ages because in the tiniest cracks we have lichen, that curious symbiosis of algae and bacteria that first appears in the fossil record about 400 million years ago, some ferns that came along about 40 million years later and also some flowering plants that didn’t make their appearance until about 160 million years ago. That’s 240 million years of evolution on one slab of ordinary rock. We’ll gingerly make our way down into the pine trees below us and see what’s going on down there. More life getting going; this time on the pine trees themselves. It must be spring! Although the tree looks as though it is covered in tiny golden flowers they are in fact the male, pollen producing cones. The wind takes the pollen and deposits it in the more familiar female cones, a cycle that can take up to two years from beginning to end. 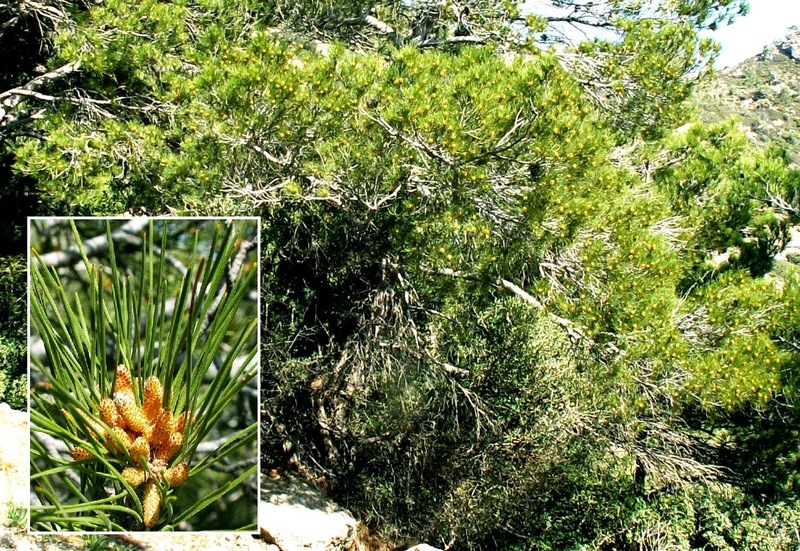 Going back to our evolutionary record we were talking about up at the Rock of Ages, pine trees came between the ferns and the flowering plants, about 300 million years ago. We’re about half way down now and that flat rock looks particularly inviting so let’s rest awhile and listen to the birds. W. H. Davies may have started his poem “Leisure” with the lines: “A poor life this if, full of care, We have no time to stand and stare.” but personally I prefer to sit. I can hear blackbirds, chaffinches, Sardinian warblers and the long drawn out dzeee of a greenfinch somewhere below us. These are lovely little finches with their bright yellow wing bars which are resident here on the island. Personally I don’t think their song is the prettiest with all those wheezes in it but the Maltese go mad for them apparently and have been trapping and breeding them for years. All a matter of taste I suppose. 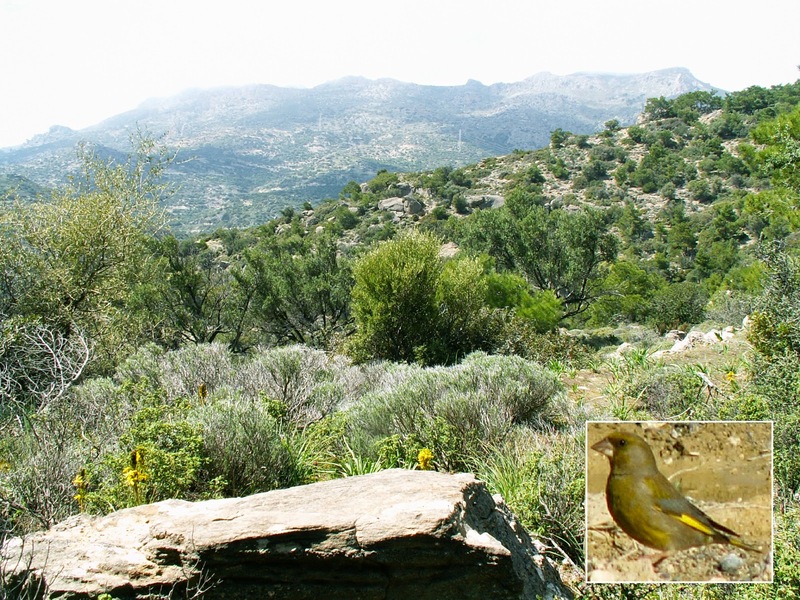 It’s difficult to pinpoint when birds first evolved from feathered reptiles but if we take Archaeopteryx to be the first true bird (and that in itself is debatable) then we’re looking at birds first appearing about 150 million years ago. Onwards and downwards this time and everything is on the slope. It really is quite unnerving sometimes to realize just how quickly the ground beneath your feet could suddenly tilt as it has here. 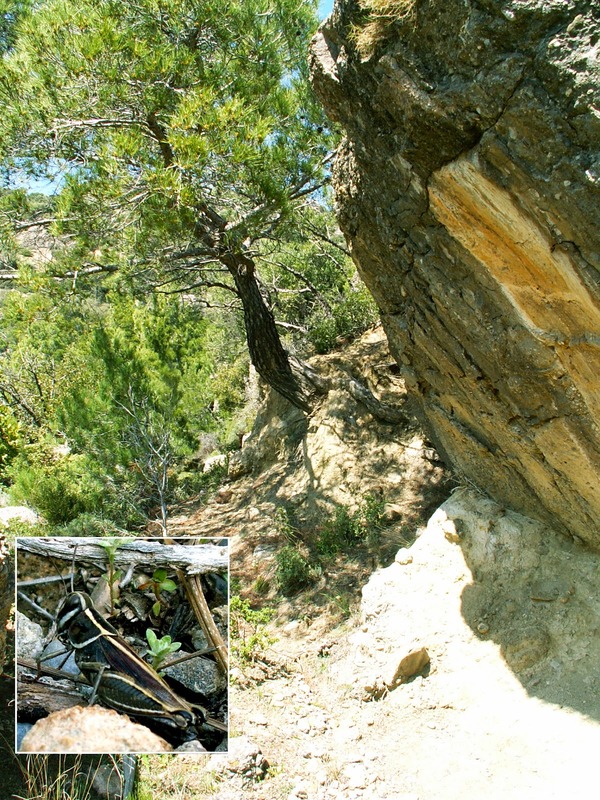 Look how the first couple of feet of that pine tree is growing out at the same angle as this overhanging slab of rock. At some time in the not so distant past they were both perpendicular. The pine has had to readjust its growth as you can see by where it suddenly bends. Hello, here’s someone you wouldn’t expect to find up here, it’s a Mediterranean Splendid Grasshopper [see footnote]. The reason I say that is because this particular species is usually to be found among the dune grasses near the beach. However, over the past couple of years the habitat at the mouth of this valley has been bulldozed to make way for a couple of beachside properties and, finding himself homeless he seems to have made his way up here. Beachside development isn’t a major problem down here in south east Crete but on other Mediterranean islands and in the Canaries it’s getting to be quite an issue for this little animal and its relatives. Let’s hope he can adapt to his new environment. There’s a lot more competition from other grasshopper species up here though so he’ll have to be tough to survive. Grasshoppers arrived on the scene about 250 million years ago following the Permian-Triassic extinction event, the worst of Earth’s Mass Extinction Events and the only one known to have caused such a major annihilation of the existing insect life on the planet. We’re getting near the valley floor now but a couple of kilometers inland so we’re still at about 150m and this pile of orange spaghetti that looks like Cousin Itt from The Addams Family is one of the most curious plants I’ve ever come across. It is a parasitic plant related to bindweeds called Cuscuta or Dodder in English. It produces masses of small seeds which can survive in the soil for ten years or more and when it germinates it immediately has a problem; little or no chlorophyll with which to photosynthesize. Using its limited embryonic food supplies it has to sniff out a host plant quickly or die. And I do mean literally sniff one out. Not only can it detect the volatile chemical signals given off by other plants but, given a choice, it will actually show a preference for tomatoes say over wheat. Having found its host, in this case Cretan Ebony, it grows a special appendage called an haustorium which it inserts into the host’s vascular system and steals the nutrients. Quite horrific really. 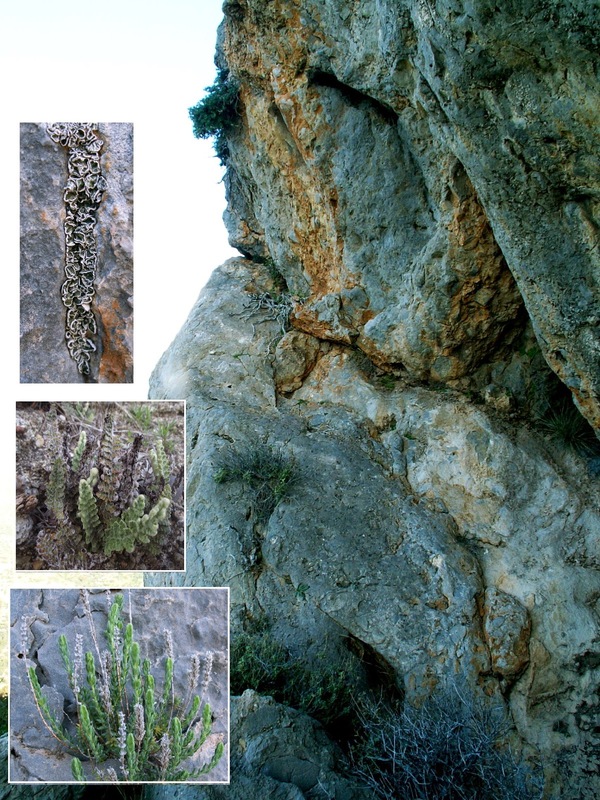 Parasitic plants obviously developed after the plants on which they live and this one is a member of the Convolvulacae family which first arrived on the scene about 68 million years ago. Well, here we are at the bottom, a little group of Homo sapiens who only evolved as a distinct species one or two hundred thousand years ago. A mere nothingth in the evolutionary history of the Earth that we've witnessed on our trip down into the valley. And now, if you look back up the side of this self same valley you may just discern a small, white speck high above us. That’s where we left the old jalopy so if you’ll just nip up and get it I’ll meet you at the beach. Didn’t think you’d fall for that one somehow. Ah, well – up we go. 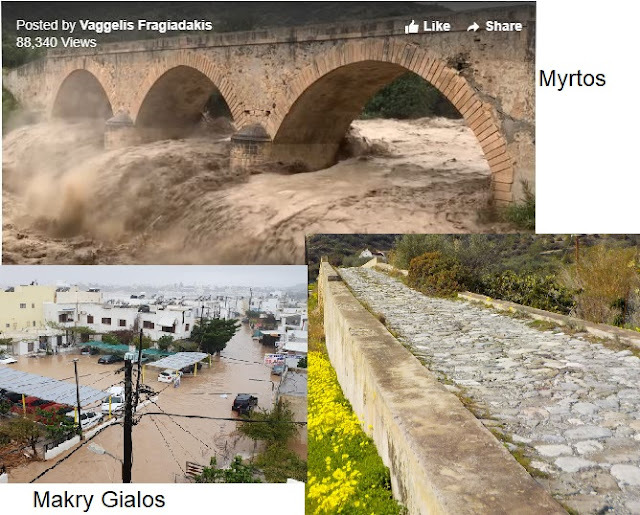 Weather Note: I’ve just finished compiling my meteorological statistics for the first three months of the year and this has been the coldest and wettest start to the year down here on the south east coast of Crete since I started recording eleven years ago. Brrr! Let’s hope for better weather to come. Special thanks this week to Stephen Lenton of cretanflora.com for identifying Cuscuta for me and the Angiosperm Phylogeny Website for details of it’s evolution. Also I am reliably informed by Axel Hochkirch of the Orthopterists' Society that the grasshopper in question is a Calliptamus species, most likely Calliptamus barbarus. Although this genus is not listed as present on Crete by Fauna Europea it does appear on more specialist Orthopterists' lists. Much as I am indebted to Axel for his correction this doesn't alter the fact that the poor Mediterranean Splendid Grasshopper is still under threat from beach side development. Beautiful which ever way you look at it...I'd be worried about sticking my hand on a sleeping snake scrambling in the crags though. Hmm....I keep going back to this blog text of Steve - again and again. I am a slow thinker so I take my time to embrace 400 millions of years. I will read the text one more time. This short composition is, however, in a special masterclass of good writing ( David Attenb. is in the same) I will read Steve´s text once more now.